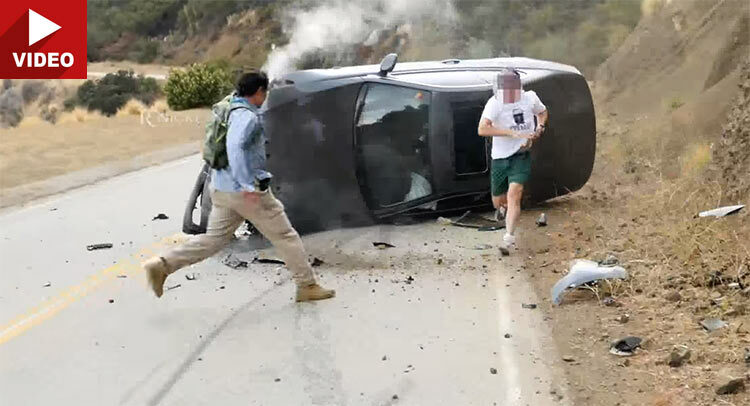 The latest episode to take place at California’s infamous Mulholland Highway that crosses through the picturesque Santa Monica mountains saw the driver of an E92 BMW 3-Series Coupe losing control around a tight corner and slamming the car into a bank before it flipped over. We’re guessing that our protagonist had ‘courageously’ switched off the German sport coupe’s electronic nannies. His exit was less ‘courageous’, as he hurried to exit the BMW from the sunroof. One man is heard in the video saying “Turn off the car, turn off the car!”. The driver replies “I’m okay, I’m okay, I’m okay, 100 percent okay”, but avoids going back to turn off the car…leaving the work for the by-stander.